Fighting for breath when police and media are declaring war against a peaceful movement could not be more pressing. Over the last month, we have seen a veritable “Sports World Spring” as athletes have spoken out on politics in a manner unseen since the 1960s. They have been inspired by the #blacklivesmatter demonstrations directed against the killing of unarmed black men and women by police as well as the inability of the criminal justice system to deliver justice. The most remarkable part of these protests was not just their breadth nor the stature of the athletes involved but that commissioners and coaches seemed to be allowing it and, in some cases, even nodding in approval. Clearly suspending LeBron James for being upset about the killing of unarmed African-Americans was not seen as savvy public relations. Now, in the wake of the horrific killing of two NYPD detectives, everything has changed. This eruption of athlete activism will probably not only come to a close but get thrown down the memory hole where the Masters of Sports keep the lost athletic years of Muhammad Ali, John Carlos and Craig Hodges. In other words, management support will die. The sports bosses—and probably friends and family as well—will tell players that it is time to shut up and play. They will be told that it would be the heights of insensitivity to be seen as criticizing the police while officers, their families and many others are in mourning. It would be tasteless, bad for business, and even dangerous. If the athlete-activists do retreat into silence, it would be a tragic mistake. 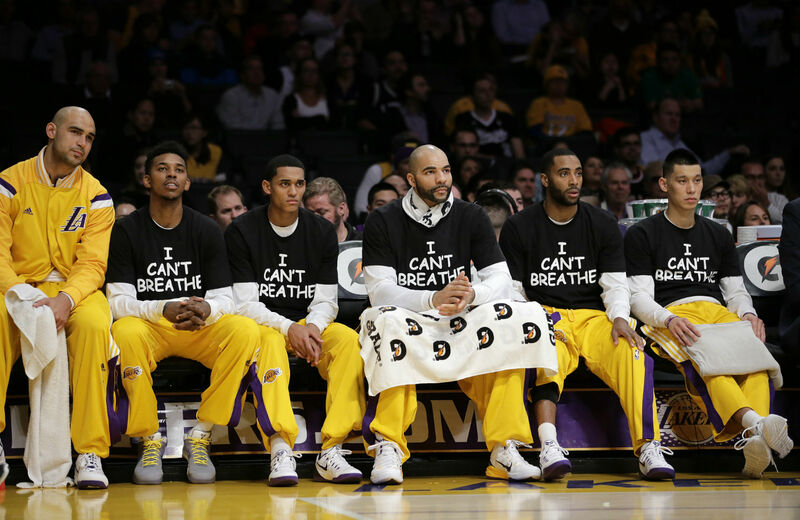 Now more than ever, players who wore the slogan “I Can’t Breathe” a week ago should wear it today. In fact, trying to find your breath when police and media are declaring war against a peaceful movement could not be more critical. For players to say that standing with the families of Eric Garner, Michael Brown, Tamir Rice and others would now be “inappropriate” is a concession to political actors who are maliciously reframing why they stepped up in the first place. The senseless murder of two police officers by a suicidal lone gunman with a history of mental illness in no way negates the single most important organizing principle of the movement: that black lives matter. Those like Rudy Giuliani, George Pataki, and their ilk who are equating this movement with violence and murder have never given a damn about opposing police brutality. Instead, they see themselves as foot soldiers in a bigger project of chilling, burying or even criminalizing all criticism of anyone who wears a badge. The entire focus of everyone involved in this movement—from the people in the street to LeBron and Derrick Rose—has been to demand that African-Americans be afforded the same humanity as everyone else: to be treated as people and not “demons” that need to be put down. There is nothing in the slogans “black lives matter” or “I can’t breathe” or the marches and die-ins that remotely suggests that projecting violence toward police is a solution to police violence. In fact, we have seen athletes like the NFL’s Reggie Bush and pro wrestler MVP who have been both part of the movement and have police officers in their immediate family. Given the explicit calls for vengeance by the NYPD and the rush by the media to place the blame for the shooting on people protesting violence, athletes could use their stature to assert that this movement is just. I am well aware that this is easy as hell for me to say. It’s not my risk. It’s not my paycheck. It’s not my livelihood. But when you lend support to a movement, you bear a responsibility for that movement’s well being. Black lives matter, and in fact that needs to be expressed with urgency. As long-time criminal justice organizer Keeanga Yahmatta-Taylor said to me, “I can hardly imagine the fear coursing through black New York today. Don’t let your young sons out of the house. This is what we can’t give into—the siege in black communities to avenge murder in the name of the law.” It’s easy when management is patting you on the back, thousands are in the street and Fox News is in the corner mumbling to itself. But now the sunshine is gone and the chill is settling in. If LeBron or Derrick Rose—hell, if Nik Stauskas or Jeremy Lin—can turn their spotlight into even a little bit of sunlight, it will make a difference. If you believed that LeBron, Kenny Britt, Ariyana Smith, the women of Berkeley and so many other athlete activists were on the side of right a week ago, then there is no reason to not believe that they are still right today. Their voices are needed more than ever.